Eye catching solid wood frames sets this Double Cotton Hammock with Solid Pine Stand apart from the crowd. It is a natural choice for a rugged design aesthetic or will compliment an immaculate manicured space. The stand provides durability and the densely woven double cotton hammock comes in the spectacular Vivere colours that you've grown to love. Or, a solid, neutral option keeps your space classic. Brazilian Hammocks offer an ultimate form of comfort and relaxation. These hammocks are tightly woven with high quality cotton thread resulting in a heavy, durable fabric. A natural choice for a Caribbean experience. Brazilian Hammocks offer an ultimate form of comfort and relaxation. These hammocks are tightly woven with high quality colourfast cotton thread to prevent colours from running. A natural choice for a Caribbean experience. A top choice for challenging the elements! The Brazilian Sunbrella<sup></sup> Double Hammock offers solution dyed acrylic fabric that is made to outlast every season, year after year. It is as comfortable as cotton, but is made to withstand fading from the sun and even cleaning with bleach. In this hammock, keep the vibrancy alive and enjoy the durability without the worry. Introducing the best of both worlds, Vivere's Double Polyester Hammock with Stand (9ft) brings you the durability and saturated colour of woven polyester. This single ply hammock fits on the easily assembled stand, no tools required. Plastic end caps are fitted on all ends, allowing for a soft finish on whatever surface you choose for setup. Enjoy the freedom year after year that this product allows by locating it in the most convenient location. Easily moved to allow for sun or shade outdoor relaxation. 8 ft. Double Cotton Hammock in Natural with Solid Pine Arc Stand Eye catching solid wood frames sets this Double Cotton Hammock with Solid Pine Stand apart from the crowd. It is a natural choice for a rugged design aesthetic or will compliment an immaculate manicured space. The stand provides durability and the densely woven double cotton hammock comes in the spectacular Vivere colours that you've grown to love. Or, a solid, neutral option keeps your space classic. 8 ft. 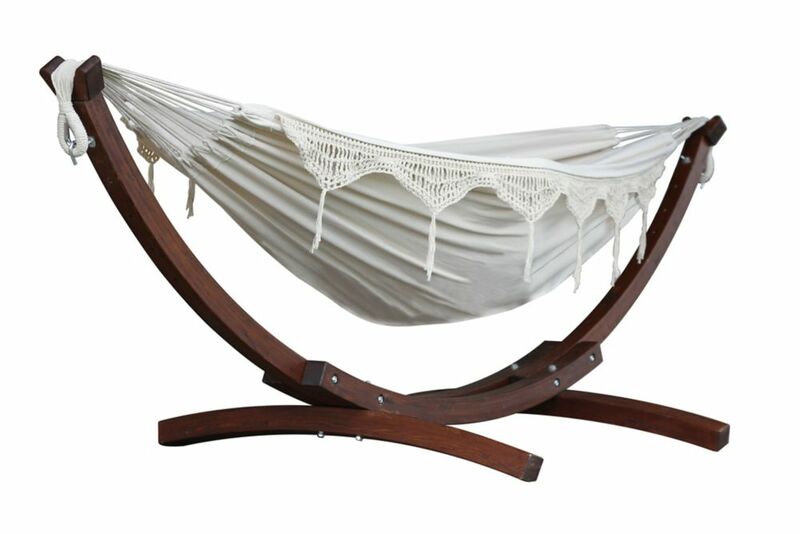 Double Cotton Hammock in Natural with Solid Pine Arc Stand is rated 4.0 out of 5 by 2.